Ever notice how pervasive stories are? Stories can be found every time interesting, entertaining communication occurs. Think of books, movies, gossip, documentaries, television series, good advertisements, biographies, autobiographies, news reports, ........ the list goes on and on. When people want to communicate about events in entertaining, effective ways we make really good use of stories. Every nation in the world makes really good use of stories and the same narrative structure to build and maintain culture and community. Stories are told to and shared between all ages from babies to centenarians we can all enjoy and appreciate a good story. There's something warm and loving about the way human beings share stories. Here's a photo that's a bit precious to me. 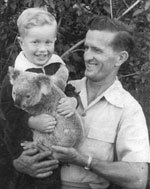 You can probably guess that it's me and my dad and a Koala (from Lone Pine Sanctuary in Brisbane). It reminds me of all the times we went on family excursions and picnics and trips. Telling stories from your family and personal life to children is a really good sharing activity to model for young children, especially if you tell those stories in entertaining ways. Think about the good times you had as children with your family and friends or parents with your children and tell some of those stories as if you are in the story. Telling these personal and family stories to children is a wonderful gift of friendship you are giving them and modelling for them. Each and every culture around the world has stories which keep on being told to children for hundreds of years. Some of them are so popular or so important that they travel from one culture to another and are told in different languages. I remember well the delight I experienced when I heard 'Little Red Riding Hood' being told in Italian as 'Capucetta Rosa'. Why wouldn't it be popular to young children around the world? If you think about its theme from the point of view of the young child - 'innocent young person is sent off on a caring mission to help someone she loves but has to overcome a really big challenge by being observant and brave and she and the person she loves is rescued by a caring adult' - it's a pretty interesting story to explore and think about. It makes a lot of sense that we should be able to tell these stories in entertaining ways for children. The more fun they have listening to stories like these the more positive and memorable the exploration learning will be for them. A fine example of one of these stories that has been passed around the world, published and republished and told many times is called 'Caps for Sale'. You've probably all read the book that makes it look like a European story but I wouldn't mind betting that it is probably of Indian or Chinese origin. I usually tell it a set of caps for props and I've worked out how to give everyone in the audience a role. I have three children being trees, they can pick what sort. I have a 'pedlar', 6 or 7 monkeys and the rest I ask to be birds who are pecking and chirping from the ground. The key thing is to have someone who can speak out quite well as the pedlar. Now this usually goes really well, we have lots of fun, especially the monkeys and I bring it all to a successful conclusion. One day however a boy, aged somewhere between three and four, gave us a wonderful demonstration of his mastery of narrative structure and storytelling. He'd been picked to be one of the trees and normally they don't do an awful lot in the story and I was at the stage of guiding the pedlar through his negotiation with the tricky monkeys when I heard him sing out, "This tree is dying!" I looked around and there he was standing with the other two trees but his branches and trunk were all drooping and very sad looking. I asked the audience, "Oh no, what will do?" Somebody said, "Water him." So we all mimed picking up a watering can and watering him. He straightened up with a smile on his face and we all thought something like, "That was great, on with the story." Towards the end though, we heard again, "This tree is really dying!" This time when we looked around our tree was flat on the ground with his branches stretched out. What could do? Someone said, "Call an ambulance!" So we had an ambulance, a couple of ambos who brought first aid water, they watered him and he arose from the dead and triumphed of the stage. Now this boy was a master of narrative communication because he knew how to get some action and attention by using the story and story structure. He didn't say, "I'm bored." He didn't even say, "This tree is bored." He said, "This tree is dying!" Magic? No. He had been immersed in story and narrative structure and was obviously very used to making sense of his world and the things that happened in it with story. Yes he interrupted but he did so without being disruptive. In fact he added to the story and the story potential. As well as that, the audience responded in story as well. 'Water him.' 'Call an ambulance.' Story and storytelling was obviously an important activity at that centre. The gift that centre had given all of those children was enourmous. Your centre can, partly through the regular programming and development of a whole range of storytelling, story reading, story creation, story publishing and story communication, develop a vibrant, human, fun loving culture of creativity which will stay with your children for the rest of their lives. © 2010 Daryll Bellingham. One copy of the above notes are available for your personal use for developing your storytelling skills. If you would like to copy, distribute or publish them whole or in part please seek my permission.